The #ResistMarch isn&apos;t the only reason Angelenos are outside today: CicLAvia is taking over the streets as well, hosting its first-ever Glendale and Atwater Village version of the bike- and pedestrian-friendly event. The last CicLAvia was in March and traversed Culver City and Venice, so this time the organization brought the street closures northeast instead. The group has slowly been covering more and more of Los Angeles, having hosted routes in South L.A., along Wilshire Boulevard, from Echo Park to East Los Angeles, and in the Valley, among other locations, so it was only a matter of time before Glendale and Atwater got some attention of their own. 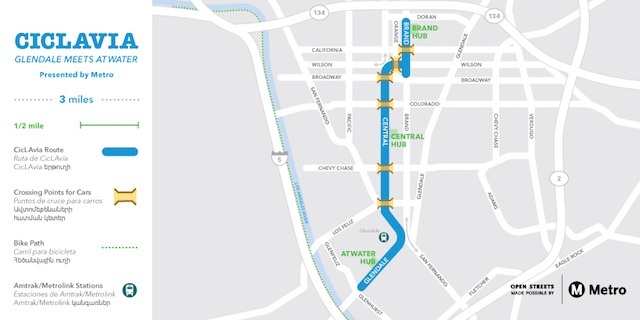 The route for today&apos;s CicLAvia covers three miles starting on Brand Boulevard in Glendale before going south on Central Avenue and finishing by going west on Glendale Boulevard in Atwater Village. The Atwater Village section of the route also connects easily to the L.A. River Bike Path. The Bike Path is popular for cyclists in the area but this is the first time CicLAvia has incorporated it in its route decision. The event goes until 4 p.m. but streets will remain closed until 5:30 p.m. 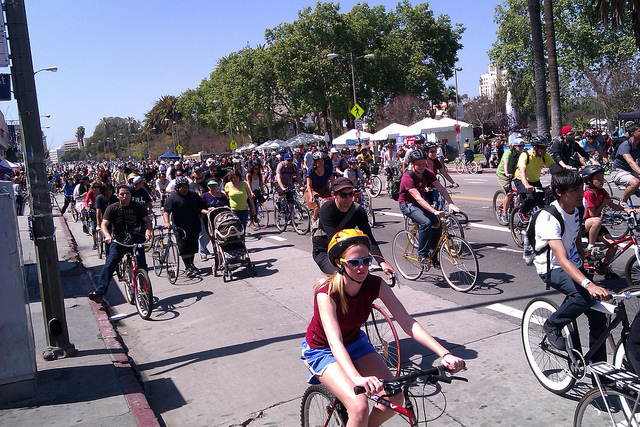 The first CicLAvia in 2010 crossed from East Hollywood to Boyle Heights and brought out close to 100,000 people, according to the L.A. Times. The organization has grown enormously since then and now collaborates with Metro. They plan to host another new route sometime during the summer, according to their website.